Visionary Art purports to transcend the physical world and portray a wider vision of awareness including spiritual or mystical themes, or is based in such experiences. 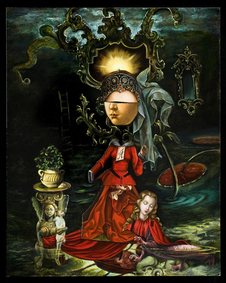 Visionaries includes an extraordinary survey of talent spanning from the mid 20th century to the present, among those artists included in this survey art: Carrie Ann Baade, Ernst Fuchs, H.R. Giger, Adam Scott Miller, Leo Plaw, De Es Schwertberger, Heidi Taillefer, Roberto Venosa, Peter Gric, Martina Hoffman, Brigid Marlin, and Madeline von Foerster. Curated by OLGA SPIEGel – FRANCE GaRRIdo – MIGUEL TIO.